It's impossible to discuss this book without spoilering its predecessor in the Devices trilogy (Hell, even the *title* was kept quiet for a while) so if you already think you might be in the mood for a modern riff on the Arthurian myths and the collective unconscious - read no further here. Go find The Pendragon Protocol and read that instead.So. Halfway through The Pendragon Protocol we learned that the archetypes of Arthurian myth with which our apparent heroes had bonded were not the only game in town; a similar loa-style symbiosis was possible with Robin Hood and his Merry Men*. Plus, the two are not wholly distinct, so what the Arthurian-possessed law-enforcers of the Circle think of as the Green Knight is known by its bearer and his Chapel allies as Robin Hood. Conversely, to the Chapel the Circle's Sir Gawain seems more like Guy of Gisburne. At one level, this is a way of saying something terribly obvious (yet still forgotten far too often): your adversary, whoever they may be, almost certainly does not think of themselves as a bad person. Beyond that, it's about patterns, and how overlapping patterns create chaos; it's Blake's 'Marriage of Heaven and Hell', where the trouble arises when the two parties impose on each other's metaphysics. Now...well, the tagline sums it up: "It's 2015, and Camelot and Sherwood are at war". Gradually escalating and coming out into the open, the conflict between Circle and Chapel is a brilliant way of talking about the primal rupture in the British subconscious between our deference and our rebellion, the present sense of an increasingly divided nation**. The effort to heal this involves tracing the mythic archetypes to their source, in passages which recall the first two (great) books in Robert Holdstock's Mythago Wood series. As the situation gets ever more out of hand, Purser-Hallard continues to find new but generally fair ways to subvert a Devices system whose rules feel solid and true despite his having only invented them one book earlier. But even for readers not massively bothered about the nation's collective unconscious, it would still work very nicely as a near-future thriller. *The first encounter I remember with Arthur or Robin was in a book containing the tales of both back-to-back, Enid Blyton's Tales of Brave Adventure. As such, my first assumption was always that they'd be friends, so this may make the conflict here particularly affecting for me. **The last novel I read was also a 2015 publication and also featured riots in England's cities. I confess myself a little concerned about this summer. Generally speaking, I have three to five books on the go at once. Equally generally, only one will be fiction - partly because that's about the proportion of fiction to non-fiction I read, and partly because I tend to only want to keep one story in my head at a time.There are a few authors in my life whose new publications are greeted with "drop everything you are reading and read this now". Philip Purser-Hallard is now one of these (less-than-a) handful. (Actually, it extends beyond dropping everything that's being read. I don't stop working, otherwise I'd get sacked and wouldn't be able to buy more books. But with these authors I tend to find myself squeezing reading in to every spare minute of the day, and I will look forward to waking up before the alarm so I can sneak in a few more pages, even if lack of sleep ends up leaving me terribly grumpy).As I said in my review of The Pendragon Protocol, I'm rubbish at writing reviews. Just read this book, it's brilliant (read Pendragon first, though). Then you'll get to the end and be bloody annoyed that (taking the most optimistic definition of 'due out in 2016') you're going to have to wait 10 months for the conclusion.On the other hand, that may just be long enough to use as an excuse to re-read Pendragon and Locksley shortly before the Trojans eventually arrive...***Just as I was typing this, my mother phoned. She's coming over for dinner tomorrow. Among other things, she let me know that she will be bringing her device with her. It took me a few moments to realise that what she meant is that she needs assistance with her new Android tablet. I am now going to spend the afternoon pondering just who my mother is allied with. 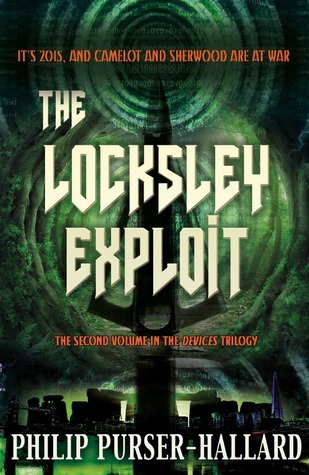 As others have noted, the worst thing about this book is the title, because it comprehensively spoils the glorious "twist" in the first of the series.And whilst this cannot be as clever simply because it's a restatement of the original premise, albeit viewed through a different lens, Purser-Hallard does a fantastic job of escalating the stakes in a generally plausible fashion.I think he loses it a little in the middle as he tries to push the action a little too hard to make the climax work, and a couple of the incidents, particularly Finn, don't quite make coherent sense, but he also pulls off some genuinely spectacular set-pieces - the moment that ends the first part when he pulls together two cornerstone moments of the two myths into one is probably worth the price of admission by itself (oh, and "The Green Flag"), and the gloriously plausible sundering myth is so well structured that it will surely turn up in "real" textbooks eventually...I also have reservations about the character trajectory of Jory - although the ending is almost inevitable, I found that because we lose sight of him too often, his decisions (even when justified by a nice throw-away line of cod-psychology) didn't really work for me.It still get five stars because this series is still ahead of the game; our generation's Mythago Wood perhaps. I can't wait to see what he has planned for the finalé.